Vojnik Budocnosti–10 (VB–10) remains a Yugoimport SDPR programme, the Serbian government having yet to commit to a formal programme of record although prototypes of the system have been tested and evaluated domestically and has also been demonstrated to several potential customers in the Middle East and the Far East. 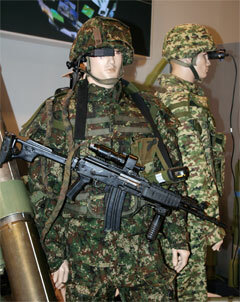 Serbian requirements for soldier modernisation began in 1999–2000 and includes all aspects of capability, elements of which are entering service and have already been selected for the VB–10 system. As part of Serbia’s infantry modernisation plans, two new NATO calibre weapons are being brought into service; the 5.56x45mm M21 assault rifle and the M77 7.62x51mm automatic weapon family. The 5.56mm M21 which dates from 1999 is offered in three barrel lengths. The medium sized barrel is issued with the VB–10 ensemble. Known as the M21BS–v10, it is designed as a weapon–sensor platform with an optical sight bracket on a Picatinny rail; which serves as a mount for an optical sight with integrated target marker which is activated from the forward hand grip. A reflex sight is attached to the top side of the optical sight and the eyepiece of the optical sight has a built in CCD camera connected to an LCD display which allows for firing around corners. The weapon can be used from both eyes and passive night sights can be added for 24 hour operations. In the VB–10, every soldier in the squad will get a system with a portion of this equipment. The system has been designed so that the camera can be removed leaving only the normal optical sight in circumstances such as low availability of power. At the lowest level, squad commanders will have the position of all members of the squad and also all soldiers have GPS equipped radios which are integrated into the system, and into accompanying vehicles for example. Platoon or company commanders will receive the positions of their subordinate unit leaders. The squad commander assistant will input information about target position and communicate this information upwards to their commanders. In addition to being able to recharge power in each vehicle, squad members will also have access to vehicle communications via an RF link the intercom out to a range of 1000m. Trials have been completed with simulated typical tactical missions, including in urban terrain operating as a system with Serbia’s new Lazar wheeled IFVs at a military test centre 30km northwest from Belgrade. These new trials took place in Autumn 2010, the first which have included VB–10 since 2007. 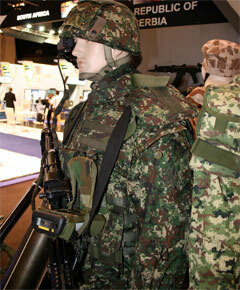 These saw fifteen sets of equipment used to replicate operations from squad up to company level. Different types of US, French and UK sourced CNRs, currently in Serbian service were also used in the trials.